Art - It does a body good! Here's a little ATC project I did on a day when I was seriously needing sunshine. I love ATCs because the small canvas makes you focus. It keeps you from letting your project mushroom out of control (yes, I struggle with KISS!). I drew this by hand (an ATC is 2.5 x 3.5 inches), and colored it with prismacolor pencils. I 'melted' the wax in the pencil to blend the color using the Gamsol method. I used Viva modeling cream in gold for the edges. I really love how this turned out. It's much more vibrant in person. It's that time again! 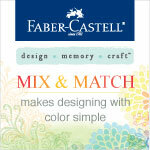 We have a new mixed media challenge over on SCS. This week, Birgit has challenged us to make brightly colored tulips with our mixed media supplies. We've had about a week of dreary grey skies and very little rain, so I was ready for pretty flowers and bright colors. I took a piece of mixed media paper from my Canson pad, wet it with water, then sprayed over Dylusions lemon zest and funky fuschia. I dried it and repeated. After it was thoroughly dry, I splatter water over the piece to create those beautiful tonal dots. 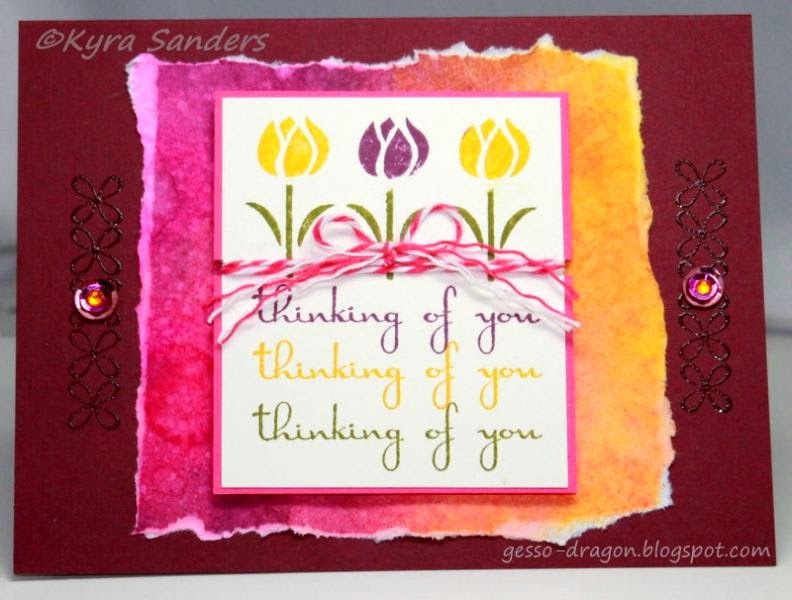 I stamped Gina K Designs tulips and sentiment in 3 colors of distress ink on cream cardstock. I mounted that on a bright pink piece of cardstock, punched a little notch to hold the twine wrap and bow. This was mounted on foam to give lovely dimension. I stamped the floral border with Versamark and heat embossed with clear powder. Just couldn't resist some stacked sequins with a little rhinestone on top. I hope you'll take a few minutes to play this weekend - you deserve some fun! Thanks for stopping by and leaving a note, especially if you have a question. Enjoy! Labels: Dylusions, GKD, Mix-Ability, SU! Click any image and you can scroll through them. Well, have you? Slowed down? I'm trying to. We are finally getting into a rhythm here, and it's nice. So I'm trying to remind myself that some things can wait a few extra minutes or even a day. I want to focus on 'feeling' each minute instead of rushing through. Part of getting back into a routine involves singing with my choir, and being refreshed by my church each week. There's lots of negative in the world, but we manage to set that aside when we come together. It's important to always put positive back into the world if you hope to get any back. I want to remember to do it NOW. There's no time like the present, right? But we still put things off until one day we're standing with our hat in our hands waving goodbye to something or someone we should have held closer. For me, ultimately, it's all about TRUST - trusting God, knowing my worrying won't change anything, but prayer can. Often, it really means I just have to LET GO of some things. That's so hard, even though it sounds simple. 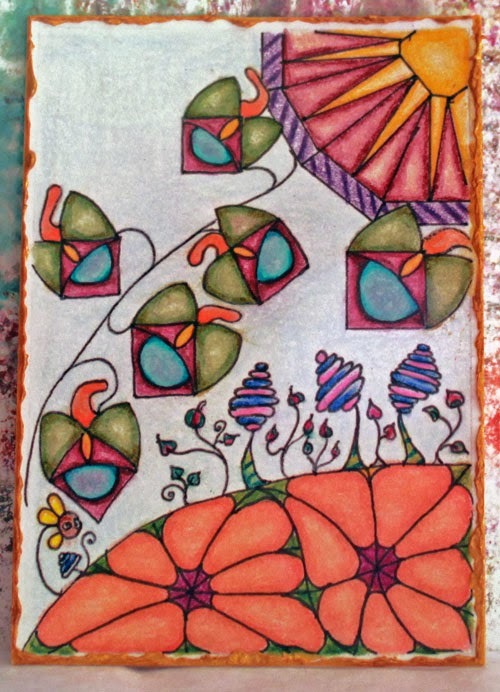 I made this page in my art journal for the SplitcoastStampers mix-abilities challenge to use text in your mixed media piece. It's the outer layer on each kite. I also used the prompt from The Documented Life to incorporate something you've recycled. The centerpiece for the kites is cut from my table protector layer of butcher paper. The list of products is down below. Thanks for stopping by today. I hope I've inspired you to pull out your toys and play. Come share what you do on SCS - we'd love a chance to share with you! Process and products: Canson 98 lb 7x10 inch mixed media paper, sprayed with water, then Dylusions sprays (After Midnight, London Blue, Melted Chocolate over wet paper, and through Crafter's Workshop stencil). Edged using modeling paste colored with Dylusions sprays, pressed through Dylusions stencils, outlined with Pitt and Copic Multiliner markers, highlighted with Copic Opaque White), clear, colored and holographic sequins are topped with rhinestones and seed beads, and there's a bit of drywall tape, Tim Holtz washi tape, and snippets of words from Rhona Farreh digital bundle. There's random blobs of gesso, too, and a Plaid Fleur de Lis stencil. I think I used every color of Dylusions sprays that she makes up to this date. I see there are new colors coming very soon! Any questions about products? Please feel free to ask! Here's my take on using this technique and a few things I discovered. First, I put my plastic baggie on my glass cradle board. This is a piece of repurposed glass that I taped and use as a lap-desk while I'm stuck in bed - nothing you need to do this technique (I just didn't want you confused by my bedspread underneath). Tip: You can click any picture and scroll through them in order for a more detailed view. On my baggie, I put various sized paper circles and strips. I did this to preserve some 'white' space - areas where there won't be any paint. This is important if you want to see the paper you're printing over through the paint. I dropped blobs of paint, then brayered it over the baggie. This is my plastic baggie after a couple of prints have been lifted. You can still see some areas devoid of paint where my bedspread shows through. ** Second Grrrr moment: paint dries REALLY FAST using this technique and does not respond like it will on a plate. ** Minor technical glitch: I didn't get photos of some of the in-between printings, but if you watch Alisa's video, then my step-by-step photos, I think you'll get the picture. Here are some of my prints - the one in the upper left was a straight pull - meaning I didn't reapply paint and press it onto the paper over and over. I applied all the paint I wanted (some is glitter paint) to the baggie, then pressed it to the paper only once. The others I pressed on 2 or 3 times. You can see the faint repeat of the big yellow flower on the bottom center cardstock. All of these were printed on Gina K Designs pure luxury cardstock. Paints were cheap craft stuff and some more expensive Golden Fluid Acrylics. The craft stuff actually performed better (and I have heard this from many other people using regular gelli plates). This one is a little different. I printed on a used manila file folder, reapplied paint, and printed over my first one, etc. Next, I cut all of these pieces down to 8 1/8 inches square and turned them into envelopes as the Envelope Board instructs. This is where the magic begins. These prints are a little flat, a little chaotic, and frankly, directionless. How do you figure out the next step? Decide on a focal point. For me, I wanted these envelopes to contain some random goodies - leftovers from past projects, bits of product laying around my studio, etc. to gift to another crafter via 'happy mail'. I have a really cool sentiment from Stampin Up! Trust God sentiment set. It says "God has given us two hands -- one to receive with and the other to give with. ~Billy Graham. Perfect! I needed HEARTS to convey the love from one artist to another. So I cut hearts out of those pesky pieces of circles that grabbed onto my brayer up in step 2. Ha! That'll teach you to mess with me! I hope you can flip that image over in your mind, because I turned it when I decided the orientation for the envelope - the big pink flower that was lower left is now upper right. I put some gesso in a heart shape in the left corner, added some stamped washi tape (SU! 's Tape It set), rubbed more gesso through stencils (the white ghosted areas), shaded around the gesso heart to make it pop with some dimension, and over-stenciled with gold modeling creme. I used a variety of product - if you have a specific question, ask in the comments or look in the ingredients at the bottom of this post. BOOM! Heehee!! This one makes me so HAPPY! I wanna dance! That gorgeous color really pops on the black cardstock. This is one virtue of paint over ink on dark paper. It's opaque. It's rich. It's playful! YES I LOVE IT!! Can you see the little bits of white fabric showing through? Yes, those spots are clear, so you can glue it down and still see some of the fabulousness beneath it. Fun fun fun! I'm running around throwing confetti, so I'd better step away from the computer. I hope you give this technique a try, and please share with us (even if it flops) over on Splitcoast. We celebrate trying things over there. Better to try and fail than to have a really clean, neat studio. Go make some magic and mail it to a random person!